If this mascara doesnt look gorgeous,I don't know what does! 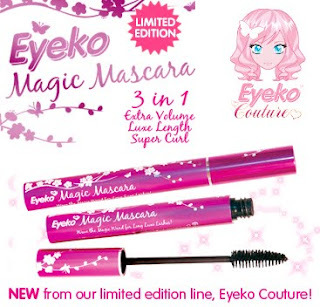 Eyeko is brilliant for creating a more "couture" line to appeal to a larger range of age groups. This mascara has a special large brush to coat each and every lash for super lush, voluptuous lashes.It also lengthens and curls,too. If this is anything like their big eyes mascara,im bound to love it.Every Eyeko product I own I am pleased with.I can't wait to get this and review it. It retails for $14 usd. You can't beat that deal! Stock up on holiday gifts to take advantage of free shipping! Tell me what your fave Eyeko items are!